Stainless steel; the very name implies virtual metallurgical immortality. Since its accidental discovery nearly 100 years ago, stainless steel has become a fixture in everything from automobile and household appliance manufacturing to skyscraper trim and turbine blades. Of course, its also well known to recreational boatbuilders, boatyards, and owners. The average cruising vessel is simply riddled with a variety of stainless steel alloys, of which there are several, that are called upon to support everything from propellers (stainless alloy propeller shafts) to headliners (stainless steel staples). It comes as a surprise to many casual and professional users alike, then, that the primary alloy contained within stainless steel is humble and familiar iron. Theres a reason, after all, that its called stainless steel. To this mundane and plentiful element other more exotic alloys such as chromium and nickel are added, giving stainless steel its corrosion resistant properties. The chrome enables stainless steel to form a tough oxide film as soon as, and for as long as, its exposed to oxygen, even while submerged provided the water contains oxygen, while nickel increases its resistance to acid. Depending upon the role it will be called upon to fill, architectural trim, cutlery, or bow rail for instance, differing amounts of elements are added, along with trace amounts of still more exotic materials such as columbium and tantalum. Essentially, there are three sub-groups of stainless steel: martensitic, which is often used for cutlery, many fasteners, and turbine blades; ferritic, which is used for automotive trim applications; and austenitic, which is used in the marine environment. Of the three, high nickel content (6 percent or more) is exclusive to the austenitic or marine grade. Thus, contrary to its silvery appearance, not all stainless steel are created equal. Marine grade stainless steel is further distilled into two popular alloys, designated by the American Iron and Steel Institute as 300 series. For recreational marine applications, the most common of these are 304 and 316. The alloy ratio used in 304 stainless steel consists of 1820 percent chromium and 812 percent nickel, which is added to conventional carbon steel. For this reason, 304 stainless steel is often referred to as 188. The alloy ratios for 316 stainless steel, on the other hand, are 1618 percent chromium and 1014 percent nickel (greater than 304), as well as 23 percent molybdenum. The final ingredient aids 316s ability to resist a phenomenon referred to as crevice or pitting corrosion. By far, the most common variety of marine grade stainless steel is 304 or 188. As one might expect, this is a function of expense; because of the alloying element content, 304 is less expensive to manufacture than 316. Nearly all commonly available stainless fasteners, from the smallest tapping screw to large nuts and bolts, are manufactured from 304 alloys. Fasteners, machine screws, nuts, and bolts manufactured from 316 alloy stainless steel are available; however, they must nearly always be special ordered, which, once again, is a reflection of their expense. There exists yet another designation where marine grade stainless alloys are concerned and it involves their carbon content. Stainless alloys that are to be welded for rails, brackets, water and fuel tanks, portlight frames, swim platform supports, or anything else, must utilize only low carbon alloy stainless steel, which is identified with an L suffix, such as 304L and 316L. The reason for this requirement is a peculiarity of stainless steel known as carbide precipitation or weld decay. When stainless or any metal is welded, its heated to high temperatures. This high temperature can cause a migration of chromium away from the weld area, leaving behind a zone adjacent to the weld of what ultimately behaves like ordinary carbon steel, i.e., it rusts. Weld migration that is a result of fabrication using the incorrect grade of non-low carbon stainless steel sometimes becomes evident early on in the life of the part by a clearly defined, discolored or darkened path that encompasses the weld. Depending upon its exposure to moisture and whether that moisture is fresh or seawater-based, the area adjacent (usually about an eighth of an inch on either side) to the weld may begin to show signs of corrosion or discoloration within months or even weeks. Stainless steels other primary weakness, the aforementioned crevice or pitting corrosion (there is a scientific distinction between the two, however, for the purposes of this discussion its not relevant), occurs when it is used in an oxygen depleted environment. The tough, nearly impenetrable oxide film that forms as soon as stainless steel is exposed to air (the term inox, seen on many European stainless components, is simply an abbreviation for inoxodizable, which refers to stainless steels resistance to oxidization or staining) only remains intact as long as the metal is exposed to oxygen. If stainless steel is placed in an environment where it is starved of oxygen and it is exposed to water, either fresh or salt, it becomes susceptible to crevice corrosion, which typically manifests itself as roughness, valleys, pitting, or even worm-like holes. The most likely location for crevice corrosion to occur is when stainless alloys are used for raw-water and underwater hardware, which may include propeller shafts, struts, raw-water intake and discharge plumbing, exhaust systems, shaft logs and fasteners, or nuts, bolts, and screws that are used below the waterline to secure hardware such as struts, seacocks, hull strainers, swim platform supports, etc. Because nearly all commonly available fasteners are made of 304 alloy, they run an exceptionally high risk of suffering from crevice corrosion when used in below-the-waterline applications (they are particularly prone to corrosion where they cannot be easily inspected, as they pass through the hull for instance). And, the exposure to water does not necessarily require submergence, stainless steel that is imbedded in hydroscopic materials such as wood, foam core, or even fiberglass may suffer from crevice corrosion. Therefore, it is preferable to avoid using stainless steel in applications where it is regularly exposed to stagnant or still water for extended periods. Ideally, high-quality silicon bronze, cupronickel, Inconel, or non-metallic alternatives should be used, particularly for fasteners and raw-water plumbing. The fasteners used to secure struts, strainers, and other underwater hardware, for instance, should be bronze rather than stainless steel. If stainless steel must be used in such an application, for a custom-made strut or shaft log for instance, it should be fabricated from the most corrosion resistant marine alloy available, 316L or 317L. Propeller shafts fall into a special category. Because they require both exceptional strength and corrosion resistance, propeller shafts are typically fabricated from a proprietary stainless alloy that includes a host of other trace elements. These mixtures yield the ideal combination for the environment in which shafts operate. Trade names such as Aquamet, Aquatech, and Aqualoy, among others, are available in several strength and corrosion resistance grades, the most corrosion-resistant of which, and therefore desirable for recreational applications where use and oxygen exposure is limited, is designated as 22. 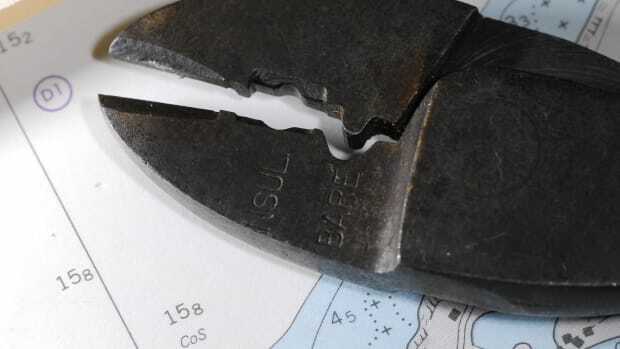 Shafts made of this alloy and grade are as close as a boatbuilder can get to corrosion-proof where steel-based alloys are concerned. Shafts manufactured from ordinary stainless steel, on the other hand, even 316 alloy, frequently suffer from crevice corrosion attacks, occasionally within less than a year of being placed in service, beneath cutless bearings and stuffing box packing, once again, where the damage cannot be easily observed. In order to avoid corrosion and failures, use stainless steel where it works best and specify the right alloy for the job.